Homeowner and visitor alike long for the feeling of beauty and grandeur that accompany a dream home. The homeowner feels pleased to linger and share their dream and the visitor may be inspired and offered a time of peace from the friend’s dream home. Signature Iron Doors offers a wide selection of designs that match many homeowners’ vision and our artisans custom design creating ever homeowners’ dream reality. Hand forged with 14 guage steel, all our iron entry doors come complete with glass, handles, locks, frame, fully insulated with weather-stripping, and finished with a zinc primer and epoxy paint. Garage Doors are produced the same way, but with 16 gauge steel and come with all track and hardware. Our extensive selection of iron gates and railings are also hand forged and given the same finish. Showcased here is our Medina style door. We always keep a stocked inventory of doors, and these are a few photos of customers near Goodyear Arizona who saw the Medina door as their dream door. There are a variety of size options and finishes for each design. 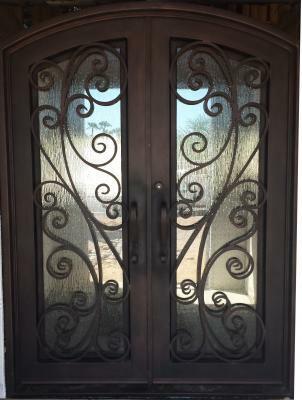 Signature Iron Doors believes as with all fine products, the quality is in the detail. All iron work is designed by an iron architect and hand crafted and welded by licensed welders. Every one of our products is supervised by our head technician and no door goes out without a quality check by him and our operations manager. We spare no expense to provide our customers with a timeless product.